Infinix Note 2 Is Priced At 5999 Pesos If You Pre Order Now! Home / infinix / mobile / news / Infinix Note 2 Is Priced At 5999 Pesos If You Pre Order Now! Last night Infinix Mobile made an important announcement thru their Facebook Group. Only the members of Infinix Note 2 Philippines (Official Owners Group) can pre-order the highly anticipated Note 2 in a much lower price tag. 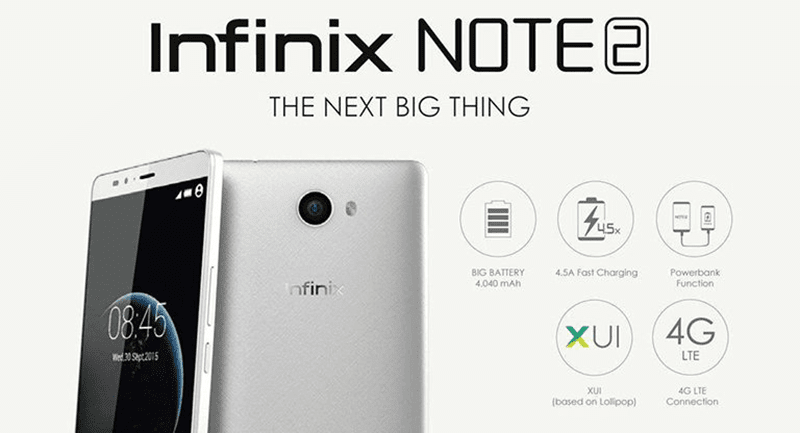 Again, to refresh our minds, the Infinix Note 2 is a 6 inch phablet with great specs on paper. It runs with 1.3 GHz 64 Bit MT6753 octa core processor paired with Mali T720 GPU, has 2 GB of RAM and 16 GB of expandable internal storage. The special trait of this device is rocks a large 4,000 mAh of battery capacity with up to 4.5A quick charging support. Other than that, this also has a capable 13 MP ISOCELL camera from Samsung and a 5 MP w/ BSI selfie shooter. This affordable good phone also loads with Android 6.0 Marshmallow w/ XUI skin out of the box. It's currently available for pre-order at just 5,999 Pesos which is 1.5K cheaper than its actual SRP. To avail that discount, you need to be a member of the above-mentioned Infinix Note 2 group on Facebook the submit your order on this link: http://goo.gl/forms/LbBChtNwHpPcPVFG3. Then it'll be delivered straight to your house this mid June of 2016 via COD w/ shipping fee. The stocks are limited for the first 300 to sign-up. Remember, you need to be a member of the group to avail that good pre-order discount.